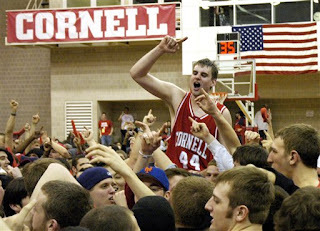 The Sports Kolache: Cornell puts on their DANCE shoes! Let the Madness BEGIN!! Cornell puts on their DANCE shoes! Let the Madness BEGIN!! Forget pitchers and catchers, this weekend the REAL sign that spring is almost here took place. Every March (sometimes sooner), the Ivy League champion clinches their conference title and thus enters automatic access to the Big Dance, firing the first of 64 Big Dance salvos that will be unleashed in the next two weeks. You see, the Ivy League is the last of the D-1 basketball leagues to crown their regular season champion as their true champion. All of the other conferences crowns their champion with a (sometimes ... ok, rarely) lucrative conference tournament. Ivy Leaguers are too busy with splitting atoms and slicing open cadavers to bother with a conference tournament so they kick it old school and actually have a regular season that matters. Personally, I am a fan of having the student-athletes play as many games as possible for my enjoyment, classwork be damned, but that's just me. Here are links to some of the latest mock brackets from around the web. We at the Sports Kolache will be tracking every tiny little tremor in the world of brackets and bubbles over the next couple weeks.